defend their revolutionary gains, December 9, 2015. Following the victory of the reactionary opposition forces in the December 6 legislative election, the patriotic forces in Venezuela are soberly taking stock of their defeat — the first since Hugo Chávez was elected in 1998 — and organizing to see that the revolutionary gains are defended against the neo-liberal forces that are backed by U.S. imperialism. The Democratic Unity Roundtable (MUD), that joins the main right-wing parties in Venezuela, won the majority of seats in the National Assembly (109), against the 55 of the Great Patriotic Pole and the three Indigenous representatives. On December 7, President Maduro met with Bolivarian governors and ministers. In the evening, he spoke to the Venezuelan people via a televised address and called for a range of consultation methods to “strengthen” the Bolivarian movement. He said that discussion and reflection were necessary to come up with a plan of action among the social movements, the United Socialist Party of Venezuela (PSUV), and other parties and organizations that back the Bolivarian revolution. “This oligarchy will never represent you,” he told the people. as part of a people’s street parliament, December 9, 2015. The President said that after an all-day meeting, reflecting on the results that saw the Democratic Unity Roundtable (MUD) opposition coalition gain a significant majority in parliament, his cabinet had made a number of decisions and come up with a timeline of action. “We won 43 per cent of the votes and the counterrevolution triumphed yesterday, for now,” he said, using former President Hugo Chávez’s famous phrase to qualify that the loss is only short-term. “They have come for the neo-liberal restoration of the far right,” he said, arguing that a defence of the revolution’s gains was necessary. Maduro said it is important to come up with a “central document for the Bolivarian revolution” and to create a separate commission for the National Assembly, which will work to defend the workers’ rights law (the Organic Labour Law), the social movements and other legislative gains. On December 8, the President held a special meeting of all the organizations and parties that make up the Great Patriotic Pole (GPP), the umbrella group of all those who support the revolution. The special meeting was part of a series convened by President Maduro to strengthen the unity of the movement and develop strategies to invigorate the Bolivarian Revolution after the parliamentary elections. The plenary gathered 842 PSUV delegates representing all territorial regions of the party, the national leadership, 43 militants from the Francisco de Miranda Front and socialist deputies from the current National Assembly. Venezuelan President and chief representative of the PSUV Maduro, announced on December 10 the findings of his party’s third Socialist Congress held on December 8 to protect the Bolivarian ideas and national sovereignty. Maduro announced a December 12 meeting to develop a methodological and strategic framework and map out strengths and weaknesses. The presidential councils were created for the people to articulate public policies and projects, with the support of the national executive, and boost the transformation and defence of the country. Those councils were elected by the bases to represent Indigenous people, workers, youth, women, and other social sectors. “Economics is not a speech,” said Maduro, “I felt alone in this battle against imperialism, in this economic war.” He proposed to convene a triumvirate meeting on December 16 and establish the Economic Congress of Socialist Thought. The project will aim to address the crisis provoked by the economic war. Nine hundred delegates of the PSUV will evaluate the situation, make plans and create proposals, he said. The Venezuelan president noted that in 2015, Venezuela suffered a 68 percent drop in oil revenues, despite no cuts in social investment. He added that the financial blockade, part of the economic war, made debt refinance especially difficult. Maduro said he requested support to begin a new model in January of government efficiency in the streets, to be deployed in the next four years. The program was launched to work on security and peace, revolutionary economics, social work, people’s power, electricity access and efficiency in government institutions. He suggested that each state’s proposal must be concrete and establish new methodologies to boost economic and social sectors. “We have to renew our discourse, form, content and media,” the president proposed. He urged members of the PSUV’s Commission of Propaganda, Agitation and Communication to review the discursive strategies and practices currently implemented. He further proposed establishing communication channels in favor of the Bolivarian Revolution. Maduro called to propel reconstruction of the majority through repolarization, repoliticization and reunification. He also denounced the media onslaught launched by the national and international extreme right that has sought to undermine the revolutionary morale of the people. Their media, he said, works in the service of the imperialist and oligarchical elite. The leader called for an immediate renewal and strengthening of all national, regional and municipal management of the United Socialist Party of Venezuela. In light of the declared restructuring, he called on the Great Patriotic Pole to help propose names for the renewal process of the Bolivarian Government. The Venezuelan leader repeated that Venezuela is suffering from an international financial blockade that impedes both the progress of the country’s economic system and the fight against the economic war waged by the Venezuelan right, backed by foreign powers. “It’s indirect blockade, an internal boycott of distribution, commercialization and pricing,” he said. Following the meeting with the organizations of the GPP on December 8, in his regular weekly address, Maduro announced an upcoming cabinet shuffle, indicating he had asked ministers to submit their resignations. He thanked the ministers for their contributions and pledged that the socialist movement will “continue in the battle with humility” with a focus on the people. Despite the blow of defeat, all those who have given their blood, sweat and tears to build the Bolivarian revolution refuse to indulge in feelings of self-pity, news agencies report. 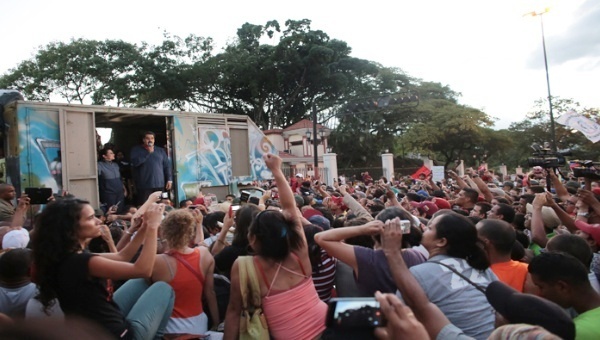 Instead, they humbly view the outcome of the election as an opportunity from which a lesson can be learned, the revolutionary movement reinvigorated and the necessity of the revolution reaffirmed through renewed mass work amongst the Venezuelan people, TeleSUR wrote. “Luciana Vazquez is the coordinator of the Barrio Tricolor mission in the Caracas district of Mamera. The program, first created by Hugo Chávez and relaunched under President Nicolás Maduro, aims to transform communities and use planning and infrastructure to bring dignity to neighbourhoods. The emphasis is on the community, and on power and decisions from the bottom up. Luciana told TeleSUR English that the loss of the National Assembly was an opportunity to deepen the revolutionary process in Venezuela. “She admitted the current situation was difficult. Although the opposition has at times claimed it wouldn’t dismantle the social missions, she feels some of her resources could be in danger. But she said that the results showed that the social movements have a lot of room for improvement. 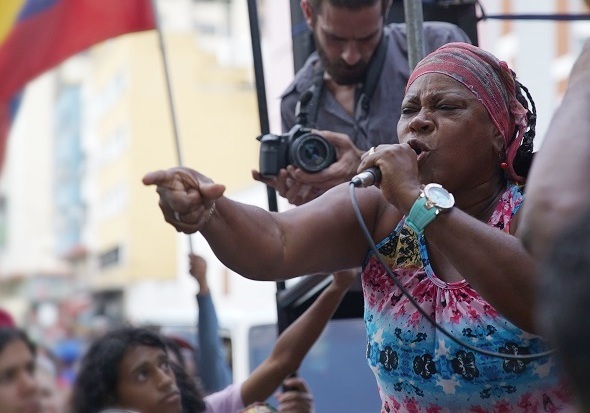 “Pacha Catalina Guzman, who works with Antimantuanos, an autonomous organization unifying communal councils with musical and sporting events, said that she was not expecting the opposition to gain so many seats in the National Assembly. “‘But we see it as an opportunity, not as a defeat. This is a historic moment to deepen our work with communities. We will work harder in communities,’ she said. “With the whole world watching and waiting for some kind of fraud or outrage to be committed, Venezuelans voted peacefully and calmly, and Venezuela’s electoral body said that there were no irregularities. Pacha said that even though the outcome had not been what they had been hoping for, the process changed international perception of the left in Venezuela. “‘For us, the election was an opportunity to show other countries that there is democracy in Venezuela. It was won by a sector that if they lose, there is violence. We lost, and we respect the result, and we are calm. I want to say that the elections were a demonstration of democracy. We respect the results, without resentment or violence. We continue building,’ she concluded. Elsewhere across Venezuela, elected neighbourhood councils and other grassroots organizations are convening themselves to take stock of the results and see how to proceed. In 2006, the Chávez government passed a law to empower local citizens to form these elected councils which exercise decision-making at the community level in favour of the people’s interests. Local people’s organizations such as these are a cornerstone of the Bolivarian revolution. Jorge Rodriguez, head of the socialist party’s campaign in Venezuela, praised the country’s rich democratic tradition that saw the opposition win control of the National Assembly for the first time in over 15 years, but warned that supporters would not tolerate any attempts by the new assembly to roll back the gains achieved since 1998. “The people showed that Venezuela is a country of peace, which has one of the strongest democracies in the world and rejects violence,” said Rodriguez. Representatives from MUD said they would use their majority in the assembly to repeal critical laws such as the Law of Fair Prices, which ensures important commodities are affordable for the entire population, and the Organic Labor Law. “The annulment of the law would lead to the dismissal of workers. We will not allow that. Here we have a dignified people, a Chavista president and a revolutionary government that will protect the people,” stated Rodriguez. Rodriguez also called on the newly-elected assembly members to respect the constitution, approved under the late President Hugo Chávez by popular referendum in 1999 with over 70 per cent support. Henry Ramos, the general-secretary of one of the parties within the MUD, has already made comments attacking the constitution. Officials from the MUD have also said they would attempt to remove President Maduro from his post. The Venezuelan constitution allows for the National Assembly to recall the president without a prior consultation via plebiscite if two-thirds of the assembly votes for it. Amongst other nefarious plans, reactionary forces have also floated the idea of using their legislative majority to push through an “amnesty law” to release their counterparts who are imprisoned for serious crimes against the Venezuelan people. Maduro said that he plans to veto any proposals for an amnesty law for those opposition forces spuriously refer to as political prisoners, such as jailed opposition leader Leopoldo Lopez, whose charges came down in September. Lopez is imprisoned over charges of public incitement of violence and association with crimes committed during opposition protests and violent street barricades, known as “Guarimbas,” that killed over 40 people in 2014.